Keeping the delicate skin of your baby clean is imperative for their proper health. Bathing not just helps keep the baby clean but the activity helps strengthen the mother-baby bond. Some babies can take some time to get familiar with the sensation that water creates upon contact with the human body. But that is usually a very short period, and it usually doesn’t take much time for the baby to start enjoying baths. There are multiple baby bath essentials based on the age and needs of your baby. Top and tailing refers to the method of bathing the head, hands, neck, and nappy area of your new baby without giving the baby a complete bath. Health professionals mostly recommend bathing your baby twice or thrice each week when they are newly born and increase frequency with age. On the days you do not bathe them, top and tailing would ensure a clean and contended baby. You could purchase a unique bowl for top and tailing, which has different compartments that clearly mark top and tail so that the water is hygienically separated and there is a cotton wool area. After that, all that you require is some warm water for washing. You could buy a unique baby bath for washing your baby until they grow older and start using the family bath space. There are several design options to select from and the ideal bath tub for your baby would be dependent on the personal preference of your baby and you. Most baby baths for newborns have special rests for the back and head to provide your baby support, while some are shaped like a bucket and help your baby sit erect. Some can be folded flat for storage reasons; other models can monitor water temperature, so that you know the water is not too cold or hot. Baby baths could be placed on the floor and are portable too. You may take the bath to another room if the temperature inside your bathroom is a bit too cold. 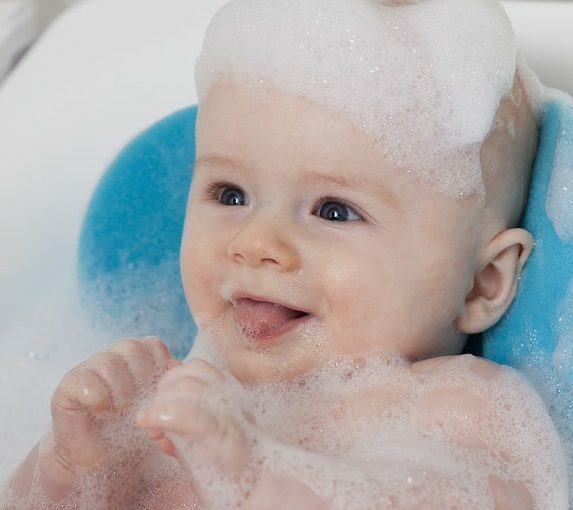 A baby bath essentials comes good only for a month or two, which is why some parents go with a bath support for a newborn in the bath for adults. Your baby would require a bath support until they are close to six months or are old enough to sit up by themselves. Bath supports let your baby recline without completely submerging in the water. These supports could be made from fabric, plastic, or foam and are designed to impart ergonomic comfort.